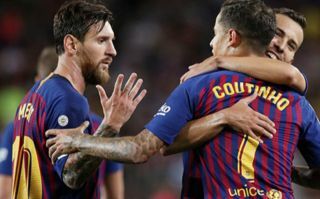 Manchester United and Chelsea’s transfer plans may have been given a significant boost as it looks like Barcelona are ready to negotiate the sale of Philippe Coutinho this summer. According to the Daily Mirror, Barcelona would be willing to listen to offers for the struggling Brazil international, who has been a disappointment since his big-money move from Liverpool last season. The Mirror’s piece notes previous talk of United’s interest, while Chelsea have recently been linked with Coutinho as a potential replacement for Eden Hazard by Spanish source Diario Gol. It remains to be seen who might be in the better position to snap up Coutinho, but both clubs could undoubtedly do with a player like him for next season. Having shone in his time in the Premier League, the 26-year-old could be an ideal like-for-like replacement for Hazard at Stamford Bridge. Philippe Coutinho to Manchester United or Chelsea? United, meanwhile, need an upgrade on the off-form Alexis Sanchez, with Coutinho certainly capable of being that player for them if he can get back to anything like his best form in a Liverpool shirt. It hasn’t worked out for Coutinho at Barcelona, but returning to England might be the kick-start his career needs right now.